Nate is illustrated with glowing light-brown skin, chubby cheeks, and a head of curls. His moms appear Latinx. The short story takes readers through a day in Nate’s life. He goes shopping for shoes, picnics in the park, and spends time with friends. During every event he discovers a new “best best” color. Nate’s moms help him understand that choosing between people and colors isn’t always necessary by showing off a rainbow flag they’ve created for the Pride Parade. Nate gets excited and wants to make a Pride flag to show all his best friends! This is a good story that’s aged well. I love that it is bilingual and features such a racially diverse cast of characters. 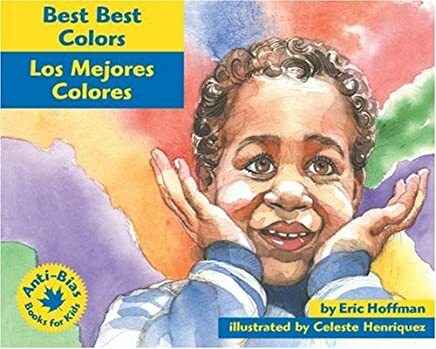 Even more pleasantly surprising is the incorporation of a child in a wheel chair, an uncommon representation in children’s picture books even twenty years after the publication of Best Best Colors/ Los Mejores Colores. The lesson imparted is universally relevant and likely to engage young readers.